Michael Barnes and Victor Ryzhov have been selected as the recipients of the 2017 Distinguished Graduate Faculty Award. The award honors exceptional members of the graduate faculty for their scholarly achievements and outstanding contributions to graduate education at the university. In addition to receiving $2,000, both recipients will be honored on Saturday, Dec. 16, during the Fall Graduate School commencement ceremony where they will be presented with a plaque. Barnes, from the School of Art and Design, and Ryzhov, from the Department of Chemistry and Biochemistry, were chosen as recipients for the award due to their professional accomplishments and well-deserved praise from colleagues and students. Both have strongly demonstrated a commitment to providing their students with rewarding academic and professional opportunities. Barnes, who earned his B.F.A. degree from Alma College in Michigan and his M.F.A. degree from the University of Iowa in Iowa City, has taught at NIU since 1998. Since then, he has dedicated himself to mentoring dozens of graduate students in the School of Art and Design. 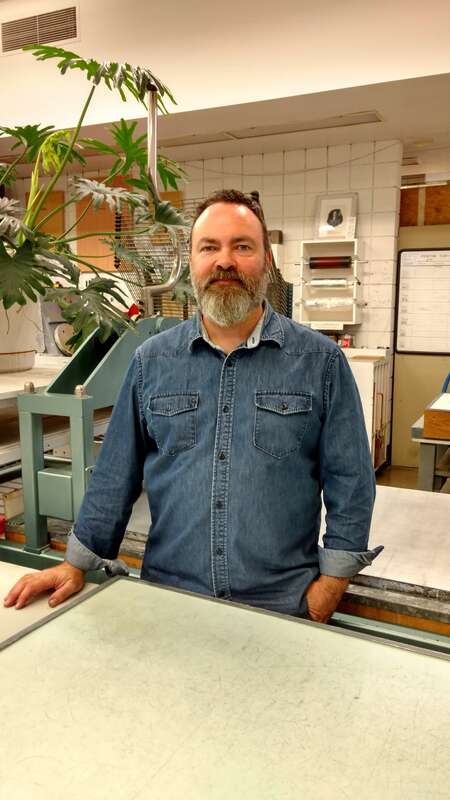 An accomplished artist, Barnes is credited with building a printmaking program that is ranked in the top 20 in the country. Barnes’ work is part of numerous collections and has been exhibited both nationally and internationally in three commercial galleries, 20 solo exhibitions and well over 100 group and juried exhibitions. His professional accomplishments and connections have contributed to student success beyond the classroom. In addition to his duties in the classroom, Barnes has arranged international internships, organized the NIU Printmaking Triennial, coordinated trips to professional conferences, headed study abroad trips, put together visiting artist and presenter programs, organized public events to highlight graduate programs and advised the student printmaking club. Ana Cortes Llamas, a student who nominated Barnes for the Distinguished Graduate Faculty award, decided to come to NIU after being mentored by Barnes during an international printmaking conference. Like Barnes, Ryzhov is widely respected for his professional work and research in his field. Earning an M.S. 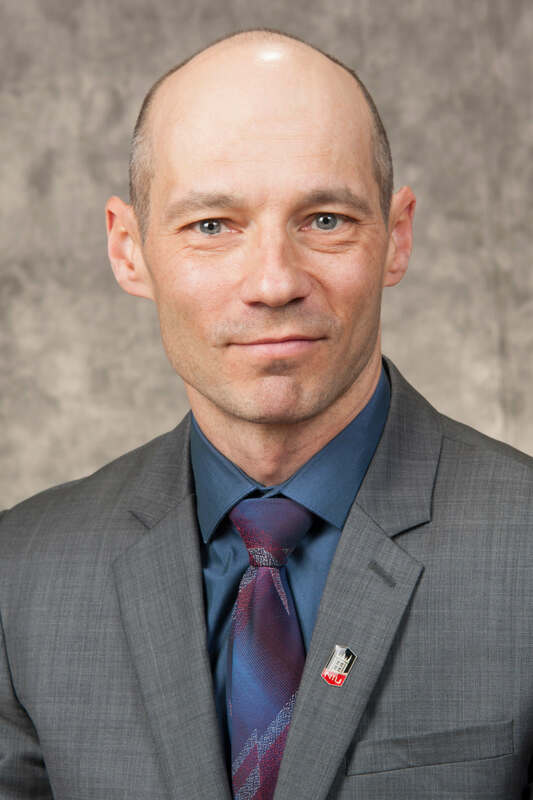 degree in chemistry from Moscow State University in Russia and a Ph.D. degree from Case Western Reserve University, Ryzhov held a postdoctoral appointment at the University of Maryland, College Park, before joining the faculty at NIU 16 years ago. His research interests include bioanalytical applications of mass spectrometry and gas-phase ion chemistry, structure and reactivity of radical ions, and gas-phase catalysis with metal ion complexes. In the Department of Chemistry and Biochemistry, Ryzhov teaches undergraduate courses in introductory, general and analytical chemistry, as well as a graduate course in mass spectrometry. As the current director of Graduate Studies, his department colleagues in the College of Liberal Arts and Sciences say the quality of his mentoring and leadership is unmatched. Victor has helped graduate six Ph.D. and five M.S. students who all co-authored articles published in peer-reviewed journals, many of which are prestigious in the field. In addition to his work in the classroom, Ryzhov has served on the Graduate Program and Graduate Admissions Committee, has worked to enable domestic and international travel opportunities for his students to engage in collaborative research, has co-written and submitted a National Science Foundation proposal, and has a noted record of helping students receive awards. Ryzhov also has a noted record of student job placements at national and multinational corporations. Ekta Mishra, an alumna of the program, had a job waiting after graduation, which she largely credits to Ryzhov’s commitment to her success in the field. This page was last updated on November 30, 2017. Please contact us at art@uiowa.edu or 319-335-1376 if you need further information.